With the second installment of Watchmen, I’m reminded why I love this book so much. With the introductions of all the main players out of the way in part one, the textured layering of the story becomes apparent. What could have been a series of flashbacks is instead a moving look back on the life of a man who is by no means a good man. And amongst all of this, the mystery surrounding the death of the Comedian deepens. We open with both the funeral for the Comedian and a visit between the mother and daughter Silk Spectres. Each panel alternates between these two scenes, the dialogue in Sally Jupiter’s (the elder Silk Spectre) echoing the grimness that is the rain soaked funeral. Through flashbacks, we learn who the Comedian was through the eyes of those who knew him – the other super heroes. Sally remembers meeting the Comedian as part of the Minutemen in the 1940s. She also remembers how she was raped by him after one of their team meetings. Ozymandias remembers meeting the Comedian in the 1960s at a failed attempt to unite the new crop of heroes into a team. We come to a greater understanding of the Comedian’s nihilism. Dr Manhattan encounters the Comedian during the celebrating of America’s victory in Vietnam. As Manhattan grows more distant from humanity, humanity becomes one big joke to the Comedian. For Nite Owl, he recalls working with the Comedian during a 1970s riot. As the world seems to fall apart, the Comedian sees himself as the embodiment of the American Dream. A sick and twisted dream. Finally, Rorschach follows an ex-villain who was present at the funeral, only to find out that the Comedian, in his final days, was a broken man, having discovered something that he should not of discovered. 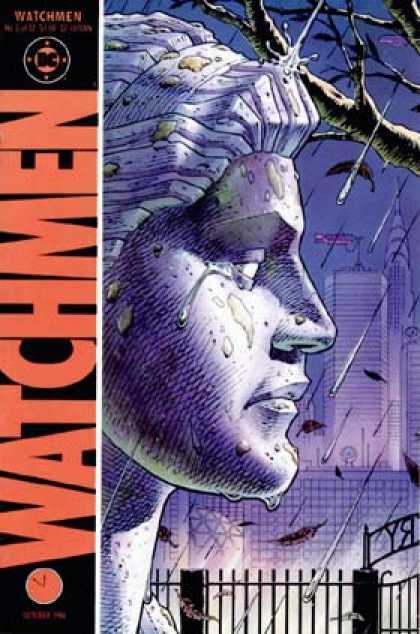 In this chapter, we gain a grander awareness of the world of Watchmen. We see its past. We see where it is now. And we see that things do not look good. We see a world spiralling out of control and heroes who aren’t really heroes stepping up to save the day. We see both Dr Manhattan and the Comedian becoming less and less human over the decades. There’s a growing sense that everything is not going to be okay. For the Comedian, a character we meet only in death, the world is one big joke. The only reason he can get out of bed in the morning, the only reason he can do what he does, is because he recognises the absurdity of the world. Bad things happen for no reason. There is no point to being good or kind or virtuous. Because at the end of the day there is no point. The world view of the Comedian is not the world view of a Christian. When we look at the world, we don’t see a cosmic accident. We don’t see a moral code that exists for no reason. We don’t see an empty shell of a purpose for living. As Christians, we know that there is a God who not only created this world but maintains it. We know that God has a plan for this world. That he recognised that sin has infected our world and that we needed to be saved from it. That God sent his son, Jesus, to die on the cross so that we could be rescued from sin. Christians are promised a future existence in a perfect world. That’s no joke. For the Comedian, there is no point to life, so he might as well do what ever he likes. As Christians, we know that there is a loving God with a plan, so we live for him. Our lives have purpose and direction. This knowledge brings me to joy and excitement, not the cynical bitter irony of the Comedian. Will the world of Watchmen bring certainty and direction to it’s cast? Or is the Comedian right and it’s all one big, futile joke?